Even before Stepan Jedlička slit open the third envelope of his morning post, he knew to dread its contents. The seal told him that his enemy had sent it, and that alone was cause for apprehension. But even with a spike of fear to rouse him from his usual morning stupor, he did not notice the odd stiffness within the paper until it was too late. This story has its genesis in a pair of earrings. Elise Matthesen habitually gives evocative names to the jewelry she makes, and has been known to strike deals with writers wherein you get a slight discount if you pledge to try and write something named after the jewelry. Well, years ago — I forget how many, but I’m pretty sure it’s more than a decade — I bought a pair of earrings from her called “At the Sign of the Crow and Quill.” I had a subconscious feeling of what kind of story that should be . . . but it didn’t actually grow a plot until I was invited to submit something to Lace and Blade 4. That anthology series showcases exactly the kind of thing I had in mind: stories of highwaymen and duels and other such elegant, swashbuckling things. 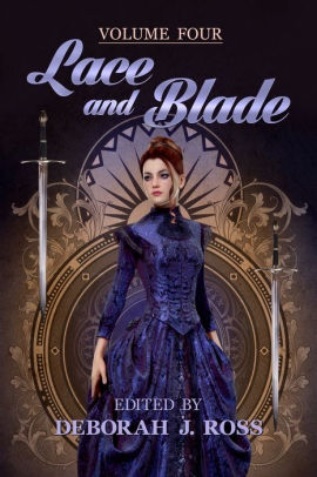 With that impetus, I finally managed to turn the title into a story — and it will be published soon in Lace and Blade 4, edited by Deborah J. Ross!